A strike by Ontario's college teachers is shedding light on a trend in higher education that some say is "shrouded in secrecy" and needs public attention. Precarious work is a trend in the labour market in Canada in general, but it's not necessarily associated with the ivory towers of the country's post-secondary institutions. Universities and colleges, however, are increasingly putting faculty on short-term contracts instead of hiring them for full-time, permanent jobs. "I'm not an anomaly. I am increasingly the new norm," said Frankie Cachon, a contract professor in the University of Windsor's women and gender studies department. Precarious labour in academia is now "entrenched within our institutions," said Cachon, who has worked on contracts since 2004. "And people are suffering." Cachon, 40, said she loves her job, but the fact that it's not a secure one means plenty of challenges — professionally, financially and emotionally. "I know all too well the psychological cost of having to reapply for your job every four months," said Cachon, who has a PhD in sociology and specializes in social justice issues. Contract faculty are paid less per course than their full-time colleagues, and they don't get health or pension benefits. They have little to no job security, often hired for one academic term at a time, which means they have no guarantee of a steady income. "It's not a great way to live your life," said Al Uhryniw, a teacher at Algonquin College in Ottawa. Uhryniw is among the 12,000 college staff who went on strike last Monday when their union and the College Employer Council failed to reach an agreement. More than 500,000 students are affected. Ontario's striking college teachers are asking for longer contracts for contract workers, an equal ratio of part-time and full-time teachers, and other wage and job security improvements. The teachers are getting support from academics across the country. The Canadian Association of University Teachers (CAUT) is backing them, and this weekend in Toronto it is holding a conference focused on the issue of contract faculty. It's also in the midst of conducting a national survey to gather better data on the trend's prevalence and how it affects teachers and students. David Robinson, executive director of CAUT, estimates one-third of the about 75,000 professors in Canada are on contracts. The association estimates they get paid about one-third less than their permanent colleagues. "When I tell people there are people with PhDs teaching and living below the poverty line, they are quite shocked — but it happens," Robinson said in an interview. In some scenarios, it makes sense for schools to hire contract workers, he said. For example, a school may temporarily fill a vacancy when a professor goes on sabbatical. But the "new norm" as Cachon called it, is to consistently use contract professors, and more of them. "Frankly, it's cheaper for them," Robinson said. He also thinks it's an issue of control. "When you have all these tenured professors around, who have academic freedom and job security, it makes it more difficult to manage," he said. "I think they see this as a more malleable, pliable workforce." CAUT estimates that since 1999, there's been a 200 per cent increase in contract faculty and only a 14 per cent increase in regular faculty. He and others say this is a trend the public should be concerned about. "It does affect the student experience," said Robinson. 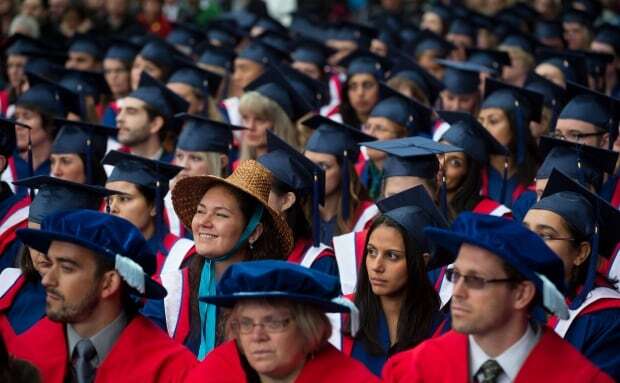 He used to be a contract professor at Simon Fraser University and recalled one year getting an email on Boxing Day asking him to teach a course just a few days later. 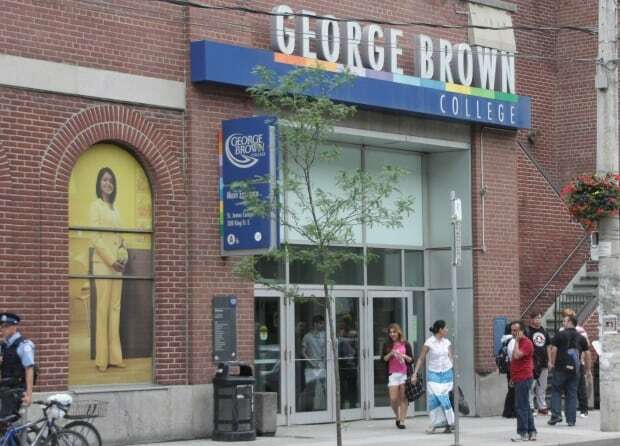 Don Sinclair, chief executive officer of the College Employer Council, the group representing Ontario's colleges in the labour dispute, said colleges have traditionally used a mix of full-time staff and contract teachers, and it works well. "We believe we've got a good quality product," said Sinclair. "I will admit we are not perfect, but we also have evidence that says that what we are doing is working for the students and employers in Ontario." He said the wages offered are fair, and that colleges have added hundreds of full-time jobs in the last five years. "These are not minimum wage jobs," he said. Sinclair called the strike an unnecessary one. Little notice to prepare courses. Having to teach hundreds of students a semester but having no office space in which to meet with them. Limited or no support for research and other professional development opportunities. Restricted involvement with the school community (they can't sit on committees, for example, that help shape the school environment). "I don't want to have to meet my students in stairwells," said Kimberly Ellis-Hale, a contract sociology professor at Wilfrid Laurier University in Waterloo who is teaching about 500 students this term and has no office of her own. A colleague lends her space. Then there's the "constant grinding level of stress and worry" hanging over contract faculty, she said, and that can impact students. "I don't want to be stressed out. I want to focus on what I'm doing in the classroom," said Ellis-Hale, who must reapply for her job every four months. Ellis-Hale became emotional when describing how hard contract professors work to deliver quality education despite their working conditions. "It would be really grand if those conditions improved," she said, her voice breaking. Universities are public institutions that should be model employers, but they're not leading by example, she said. "I think there is something desperately wrong with the public institutions that were intended for the public good to be able to fly under the radar as temp agencies — because that's what they've become," said Ellis-Hale. A Wilfrid Laurier spokesperson said the school values the role that contract faculty plays. "It is important to understand that the factors affecting compensation and continuity of employment are complex and not unique to any one institution," Lori Chalmers Morrison wrote in an email. 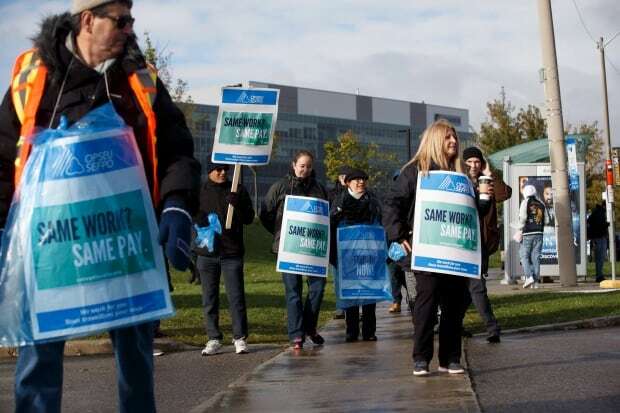 For Cachon, the Windsor professor, the silver lining of Ontario's strike is that it's helping put a spotlight on the casualization of academic labour. She sits on a contract faculty committee with the Ontario Confederation of University Faculty Associations. "To some extent, it's been shrouded in secrecy, and we want the public conversation to continue," she said. Cachon pointed out the irony of the trend: "We draw people to post-secondary education on the promise that you will get a good job, and the people who are teaching you do not have a good job."